Twice this month, groups of people have come out to listen to artists and drop them extra tips in a Facebook-organized act of kindness. 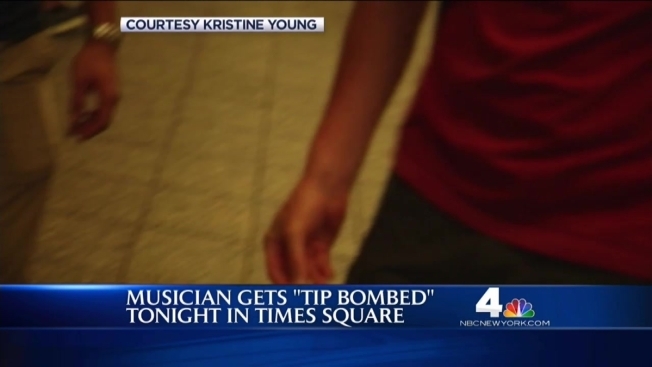 Organizers pick a busker to “bomb” and send out a message saying where and when they'll circle the artist and leave the tips. The practice is similar to a nationwide trend, also called "tip bombing," where diners leave large tips for waitresses at inexpensive restaurants. Robert Leslie was the first subway artist to get tip bombed. The group surprised him in a lower Manhattan subway station last week. He was tipped $319 in just a few minutes. On Wednesday, a group surprised an artist known as “Guitaro 5,000” in a subway station in Times Square.